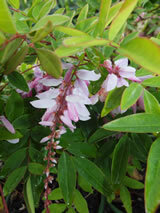 Small graceful shrub, with multi-stems emerging from the clump once established. 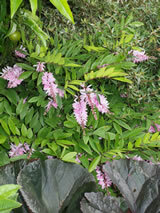 Soft green pinnate foliage emerges a bronzy-pink in spring. Lovely long racemes of pink wisteria-like flowers from spring until autumn. These hang delicately down like the skirts of a ballerina. Prefers a warm sheltered site with good soil for best results.